Home » Buddhism , Monument , Sanchi Stupa , Stupa , UNESCO World Heritage Site » Where is Sanchi Stupa located? Where is Sanchi Stupa located? Where is Sanchi Ka Stupa? Sanchi Stupa, also written Sanci, is a Buddhist complex, famous for its Great Stupa, on a hilltop at Sanchi Town in Raisen District of the State of Madhya Pradesh, India. Q. Who built the stupas at Sanchi? What does stupa refer to in Buddhism? A stupa (Sanskrit: "heap") is a mound-like or hemispherical structure containing relics (śarīra - typically the remains of Buddhist monks or nuns) that is used as a place of meditation. A related architectural term is a chaitya, which is a prayer hall or temple containing a stupa. 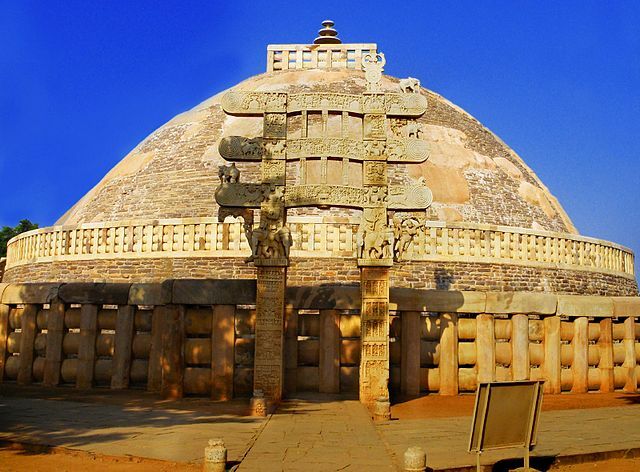 The Great Stupa at Sanchi is one of the oldest stone structures in India and was originally commissioned by emperor Ashoka in the 3rd century BCE. Its nucleus was a simple hemispherical brick structure built over the relics of the Buddha. It was crowned by the chatra, a parasol-like structure symbolizing high rank, which was intended to honor and shelter the relics. The original construction work of this stupa was overseen by Ashoka, whose wife Devi was the daughter of a merchant of nearby Vidisha. Sanchi was also her birthplace as well as the venue of her and Ashoka's wedding. In the 1st century BCE, four elaborately carved toranas (ornamental gateways) and a balustrade encircling the entire structure were added. The Sanchi Stupa built during Mauryan period was made of bricks. The complex flourished until the 11th century. Today, around fifty monuments remain on the hill of Sanchi, including three main stupas and several temples. The monuments have been listed among other famous monuments in the UNESCO World Heritage Sites since 1989. Thanks for reading Where is Sanchi Stupa located?